The #8R Utility Knife makes a great handy pocket knife. For all your general purpose cutting needs. 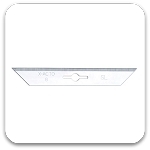 Features full blade retraction and screw position advance to hold blade to desired length. Uses X208 replacement blade.